What started off as a joke for a group of men from Utah ended up becoming something of a phenomenon. One of the undeniable perks of getting older — aside from developing a so-corny-it's-amazing sense of humor — is the wisdom that comes from having been around the block once or twice. Your collective life experiences, as varied as they are, should afford you a certain amount of useful, real-world knowledge. Being able to share that knowledge with whoever will listen is another perk. The older you are, the more people are likely to listen to you ramble on, because who wants to be the kind of meanie who shuts down a geezer (or geezette)? Not me, that's for sure. Anyone who's lucky enough to have grown up around their grandparents will know what I'm talking about. Even if you didn't, chances are there's a group of elderly gentlemen or women in your area who hang out at the local diner or deli and share stories — like this group of friends from Salt Lake City, UT. 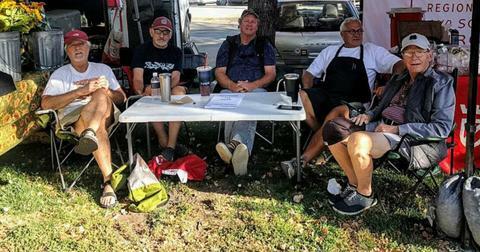 Once they realized they'd heard all of each other's stories, they decideed to stir things up a bit by setting up a table at their local farmers market and giving out some free advice. 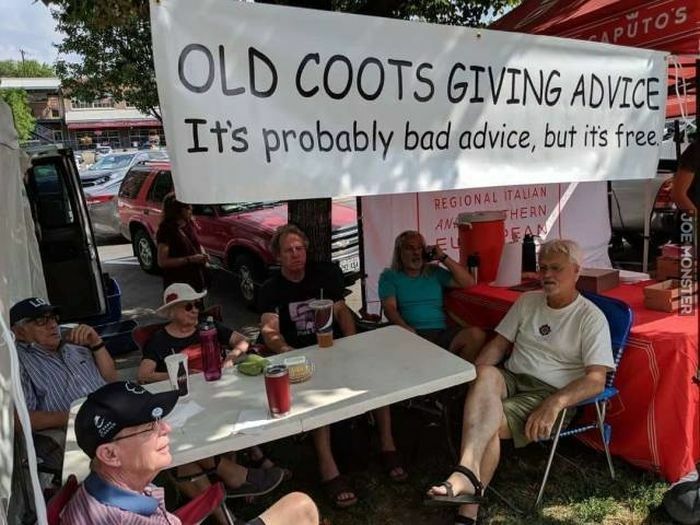 Tony Caputo, the owner of the deli where the men would shoot the breeze, made the "Old Coots Giving Advice" table official. 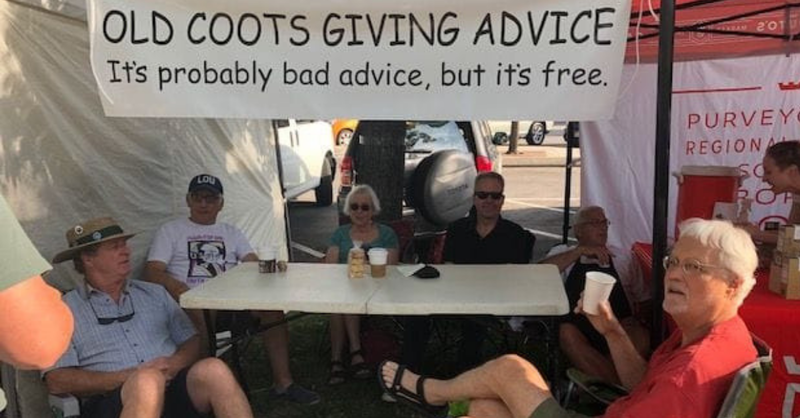 He even got a banner printed with their slogan, "It's probably bad advice, but it's free," and inadvertently created a Saturday tradition that resonated with their community in a big, big way. "We were sitting outside, bored stiff from talking to each other, and I said, 'You know what? I’m going to get us a booth across the street at the farmers market, where we can give advice," Caputo told the Washington Post. It turns out tons of young people searching for wisdom to help solve their problems. Since the "Coots" don't personally know the people they're speaking to, they're able to offer unbiased advice. Though the idea started as a bit of a gag, they take their responses very seriously and are being praised for offering thoughtful responses. There are only two topics that aren't up for discussion: religion and politics. Everything else is fair game. "Where can I find someone to love?" 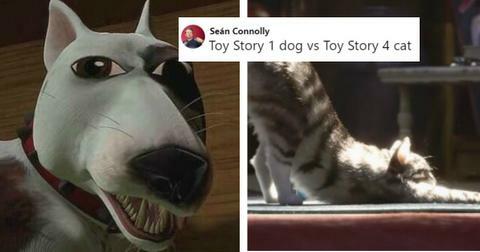 "Why does my cat pee on everything in the house?" "Have I put in enough time at my new job to take a one-week vacation?" Caputo says, "Somebody told us the other day that we're the most popular attraction at the market. We always listen carefully and don't give gratuitous advice." The "Coots" include Caputo; Lou Borgenicht, a 75-year-old retired pediatrician; 67 year-old retired elementary school teacher Gus Wheeler; Rich Klein, a 73 year-old business man whose specialized in kitchen countertops; and John Lesnan, a 69-year-old former HR manager. The only female coot is Carol Sisco, a 70-year-old former journalist. They've also got a semiformal coot mentorship program going on. Chris Vanocur is a 58-year-old "coot trainee." 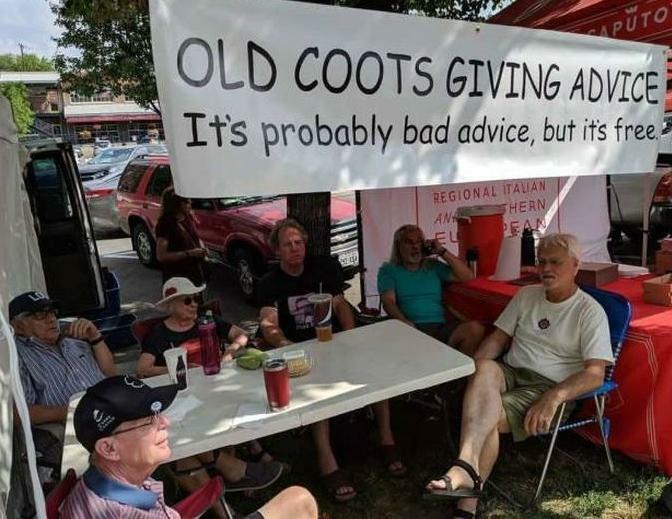 It was actually Sisco's idea to call the group "Old Coots" instead of "Old Guys." She says she "nixed it" not only because it sounded "sexist" but also because she thought "coots" had a better ring to it. I have to say, she ain't wrong. They deal mostly with matters of the heart, advising youngsters who ask how they to go about finding love to involve themselves in a club or hobby group that they're interested in. More often than not, if you're doing something you love, you'll be surrounded by other people with the same passions. And if you're chilling with a bunch of folks who have similar interests, you have a better chance of finding romance than by swiping on a bunch of random photos. Some of the questions they get are a little bizarre, but they still take them seriously, like a man who said his home was haunted. When the coots asked if moving was an option, the man replied that the ghosts follow him wherever he goes. They responded that he might want to look into some therapy and hiring a spiritual medium. Then, they met with an elderly man who said he was going blind and wanted to know what his options were. They referred him to the Utah School for the Deaf and Blind and suggested he get a guide dog. A 14-year-old girl approached them as well, visibly upset over how overbearing her mother was about her chess career (Mom was also a pro chess player). She said that while she enjoyed playing chess, she didn't want to tour the country participating in chess tournaments and miss out on school and her friends. She was scared of broaching the subject with her mother. The coots suggested she express those feelings to her mom: that she doesn't want to chase her mom's dream without having a chance to enjoy her youth and find her own ambitions. While they're getting a lot of attention, the coots don't seem to be that concerned with how "seriously" they take themselves. Like Caputo says about his group, "In addition to us teasing each other mercilessly, we’re also genuinely dysfunctional." The "coots" have even expanded their efforts into a podcast, and have their own Facebook page where they post their discussions. 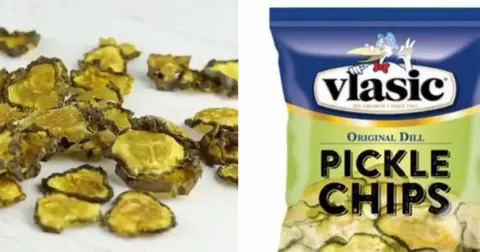 So if you can't trek out to that particular farmer's market in Salt Lake City, then they've still got you covered.